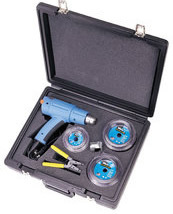 Variable temperature heat gun kit for 250 to 1100 degree F applications. Perfectly suited for heat-shrink tubing, flex conduit & heat-shrink solder tube applications. accessories to get the job done. with Potentiometer for infinitely temperature adjustment.